It was a summer of greatest hits. I’ve always been a redundant cook, content to repeat a couple dozen recipes over and over (and over and over and over), recipes that I know as though they were wired into me, the way I know my name, the alphabet, and lyrics to songs that haven’t seen radio play since Bill Clinton was president. (Wheeeeee…) This summer, I really let myself run wild in that department, which is to say that I have done nothing even vaguely wild, and it has been great. In general, I tend to be boring with zucchini. I roast it. The end. For a while, about ten years ago, I was briefly into simmering it in a tomatoey sauce with capers, a recipe that I pulled out of a magazine and had forgotten about until approximately one minute ago, when I started this sentence. But mostly, I roast it – until I found Rachel’s wonderful method, and now, for the foreseeable future, I will be doing zucchini this way. If there’s still summer squash at your local market, or if you’re one of those people burdened with a glut of it from your own garden – a problem I would like to have someday – hop to it, as my mother says. 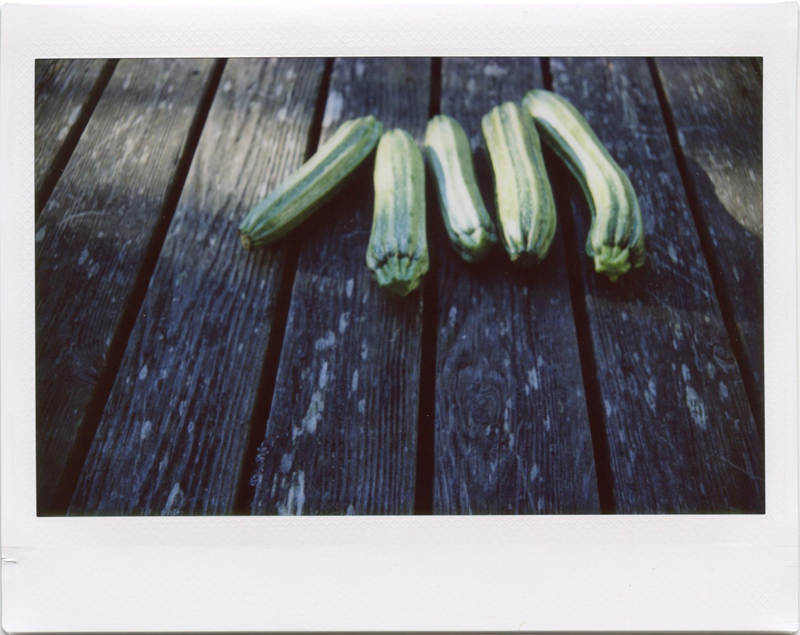 Rachel’s zucchini is beautifully Italian in its simplicity. There’s nothing to it but olive oil, garlic, basil, and zucchini that’s had the living daylights cooked out of it. I grew up believing that vegetables should be cooked so that they still have fight in them: green beans should squeak between your teeth, snap peas should snap, and the color of broccoli should never, ever be indistinguishable from an olive. But in the past few years, as I tip into early middle-age – as my friend Ben soooooooo politely put it a week ago, when I turned 35 – I have come to understand that not all vegetables want to be served al dente, and that many stand to benefit from being forgotten on the stove for a while. Take, for example, Francis Lam’s eggplant sauce for pasta, another recipe that made repeat performances this summer. And this zucchini. It begins with an unflinching amount of olive oil and a couple of whole garlic cloves. You warm them together in a large skillet for a few minutes, so that the garlic perfumes the oil, and then you fish out the former and toss it. Then you add the zucchini to the pan and stir it well, so that it’s coated in that good, garlicky oil, and you let it coast like that, cooking slowly and steadily, until it’s very soft – almost soft enough to fall apart, but not quite – and then you stir in a few torn-up basil leaves, and it’s done. The first time I made this zucchini, I took a hint from Rachel and ate mine at warmish room temperature, with some fresh mozzarella and crusty bread for sopping. Subsequent times, I served it next to scrambled eggs, stirred into pasta, and, for June, chopped finely and topped with crumbled sheep’s milk feta. But I think I like it best with just milky cheese and bread, straight from the skillet. The zucchini is almost melty in its softness, and the faint whiff of garlic, the olive oil, and the fresh basil together push the same buttons that pesto does, but with less work. I could eat it every day, and for another couple of weeks, I probably will. P.P.S. What are your greatest hits, recipe-wise? Put the olive oil in a large (ideally, 12-inch) skillet, and add the garlic. Warm over medium heat, turning the garlic cloves occasionally, for about five minutes, or until the garlic is fragrant and just beginning to turn golden. (Do not, under any circumstances, allow the garlic to burn.) Remove and discard the garlic. Add the zucchini to the garlicky oil, along with a generous pinch of salt, and stir to coat the slices with oil. Cook gently over medium (or even medium-low) heat, stirring occasionally, until the zucchini is very soft – no longer creamy-white on the inside, but rather a pale shade of yellowy green. (For Rachel, this took 15 to 25 minutes, but for me, it takes closer to 45 minutes.) When the zucchini is ready, remove it from the heat. Tear the basil leaves, and stir them into the zucchini, allowing them to wilt in the heat. Serve warm or at warmish room temperature, with fresh mozzarella and bread.